Group Discussion Ideas > Current Affairs GD Topics > Should Gorkhaland be given separate state status? Gorkhaland movement is based in Darjeeling, which is a part of West Bengal. This movement is started in 1986. In 2017, the Gorkhaland movement is revived due to the imposition of Bengali language by West Bengal on Darjeeling and other northern parts of West Bengal, where Nepali is the official language. The areas that are asking for a separate state have distinct culture and ethnicity, which is very different from West Bengal. They are called as Nepalese by others, mainly by Bengal people. This hurts their Indian identity. They are Gorkhas and belongs to India. They want to be called as Indian Gorkhas. Their fight is all about Indian Identity. No one want to be ruled by others, who marginalize them from others and do not understand their cultural needs and sentiments. People from Gorkhaland are not represented enough in the state parliament. The areas that are demanding Gorkhaland are endowed with tea, timber. These beautiful places earn lots of money through tourism. But there is a growing perception that the state government is not utilizing this money for these areas but is spending on other parts of West Bengal. Pro-Gorkhaland people argue that if Gorkhaland is made as a separate state, it will become economically rich and hence will also help Indian economy. It is vote bank politics. Some politicians are creating separatist tendencies in people for their selfish gains. If Gorkhaland is granted separate state status, more separatist movements will be started from other parts of India. Gorkhaland is too small in area to form a separate state. Instead of granting separate state, their representation in state politics should be increased. Unequal development and majoritarian politics are the main cause for separate state movements. State government must ensure equal treatment for all and should not use their power to impose mainstream’s language or culture on others. Indian government should appoint a committee to analyze whether the separate Gorkhaland state is viable or not. Afterwords :- What is your opinion on the Gorkhaland movement? Express your thoughts in the comment section below. Subscribe to our blog to get new topics delivered to your mail. Photo Credits: shankar s via Flickr, under CC 2.0. According to me Darjiling and others like Karsiung ,Kalingpon etc are the part and parcel of West Bengal it cannot separate, Different cast , different creeds different culture people we stay together in India so may be their culture is different and language is different but we should stay together , Govt should not accept for demand of separate state rather Govt should take care of their livelihood ,Gorkhas should not neglected.Other parts of West Bengal people they are getting the facility , Gorkhas should get all the civic amenities, and take care of their livelihood . 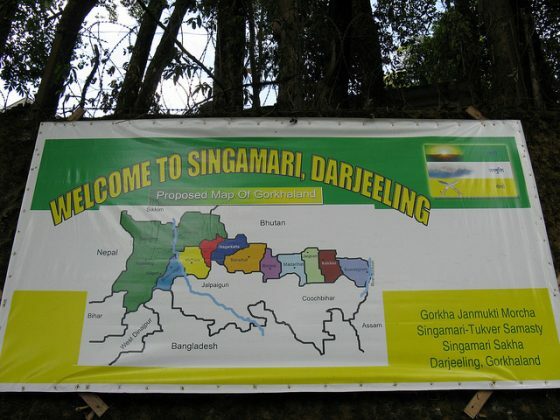 I think giving gorkhaland state from an divided बंगाल would hurt the sentiments of Bengali speaking people. It’s bcoz bengal was previously divided before independence itself. As a alternative to this problem, a autonomous state of Gorkhaland should be given to meet needs of गोरखाली speaking people to give them power in development of their state, within an undivided Bengal. Under Constitution 244A,it can be applied in Bengal with little amendment. So also there must be a mass opinion among two language speaking people.